I’ve been trying some new wavy hair products and I’m happy to be here to report my results! I have tried out the AG Volume Foam, Jessicurl Gelebration Spray, and DevaCurl B’Leave-In Curl Boost. Let’s get this going so we can find you some new products to try out! Overall, the Jessicurl Gelebration Spray worked well for my hair. You don’t have to do anything different when styling your hair with this product, so you might like it for that reason. It smelled good and it held the wave well. The only downside for me was that it gave me the same crunchy wet look that I always try to avoid. It also wasn’t great at taming my frizz which is key for me.By the end of the day, I also noticed that my hair was a little more crazy than tamed. Depending on the look you are going for, you will love this product or it won’t be quite for you. 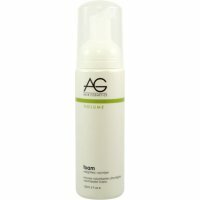 Next we have the AG Foam Weightless Volumizer. I am in love with this stuff! This was the perfect lightweight product to use that gave my waves an excellent hold. Again, you don’t have to change your normal routine to get the best results from this product. It also controlled my frizz without making my hair feel heavy, and best of all…no wet look! A little bit of this goes a long way, which is another great feature of it. For those of you who like your product lasting as long as possible for the sake of saving some extra money, this might be a go to product for you. Finally we have the DevaCurl B’Leave-In. One thing I learned about this wavy hair product is that more is better. As wavies, we're used to thinking that the more product we have in our hair, the heavier it’s going to be. But with DevaCurl, you can use quite a bit all over your head. When I use the DevaCurl, I have to style my hair differently, so if you are looking to change up your routine a bit, listen up. DevaCurl works best when you are using their Low-Poo and One Condition, so you might want to try that with the B'Leave-In. When I condition I scrunch my hair with the conditioner in and then I do a light rinse. Once I've rinsed, I flip my head over and use a towel to get a little of the water out of my hair. I then coat my hair with the B'Leave-In and scrunch away. A plus to the B'Leave-In is if you like the crunchy look you can leave it alone once out of the shower. If you want a more loose wave that doesn’t give you that wet, crunchy feel you just keep scrunching your hair with the palms of your hands until it loosens up. It’s magic! For me, this isn’t a great product to sleep in just because it looks like my hair might be dirty. It doesn’t feel that way but it makes it a litter darker than my natural color giving it a dirty look. For same day hair this stuff is fantastic, though! Reviews of hair products can make for a boring blog post, but I wanted to pass on a few products you can easily find in CurlMart that will work wonders on your waves. I also get a DevaCuut a week-and-a-half ago, so check out my video! Until then, try out these wavy hair products and let me know what you think about them! Also let me know if you have any questions about anything wavy in particular and I’ll help you out as best as I can! Until next time, keep on waving!